Situated along the Scott-Morgan county line on S.R. 52, and bordering the Big South Fork National River & Recreation Area, Historic Rugby is a restored Victorian village founded in 1880 by British author and social reformer Thomas Hughes. Rugby was designed to be a cooperative, class-free, agricultural community for the sons of English gentry and others looking to start life anew in America. At its peak, more than 65 Victorian buildings and 300 townspeople made up the colony. Today, Rugby survives as a public historic site, unspoiled by modern development. Twenty of the original buildings remain, surrounded by rugged river gorges and historic trails. Rugby has been open to the public since 1966 and is recognized by the National Trust for Historic Preservation as one of the most authentically restored and preserved communities in America. Events at Historic Rugby include the Festival of British & Appalachian Culture in May, the Halloween Ghostly Gathering, and Christmas at Rugby. In addition, the Pilgrimage of Rugby Homes is held the first Saturday in September. Visits to Rugby begin with a stop at the Rugby Visitor Centre and Theatre, which includes a 22-minute film — The Power of a Dream — on the history of Rugby. 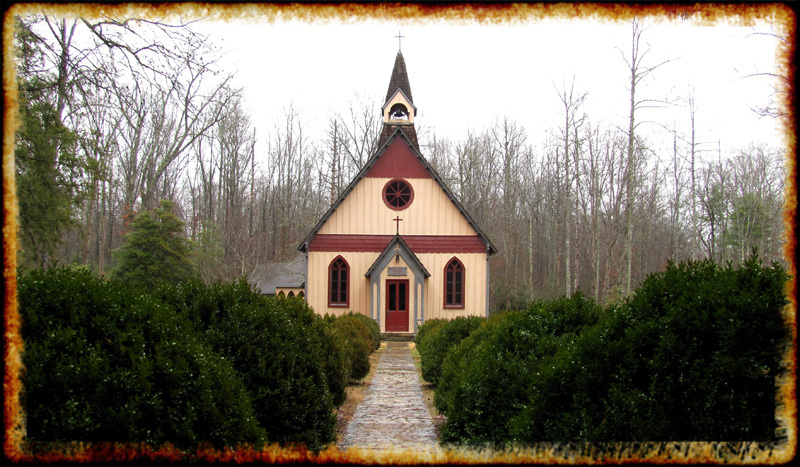 A guided walking tour includes stops at the 1882 Thomas Hughes Free Public Library, the 1884 Kingstone Lisle, the 1887 Christ Church Episcopal and the 1906 Schoolhouse. The Williams are currently building a custom 3 bedroom / 3 bath home on Homesite 10, conveniently located near their T-Hangar. 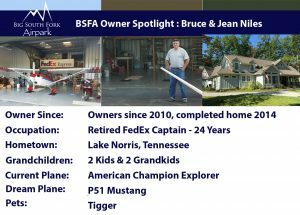 Les and Keri Williams are moving to BSFA from Illinois, previously living in Alaska. Big South Fork Airpark Custom Homes is the builder, and they have chosen a floorplan from Mosscreek. 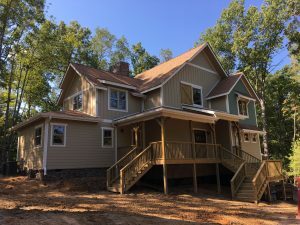 BSFA Custom Homes has partnered with MossCreek, a Knoxville based leader in luxury log and timber framed home designs, in order to provide quality plans to all our residents. Their home has an open floorplan featuring a spacious open kitchen, outdoor living elements and a detached garage with an upstairs apartment. We are excited to welcome the William’s into the neighborhood and so happy they chose to call Big South Fork Airpark home. We believe our community is what makes us different than other Airparks. 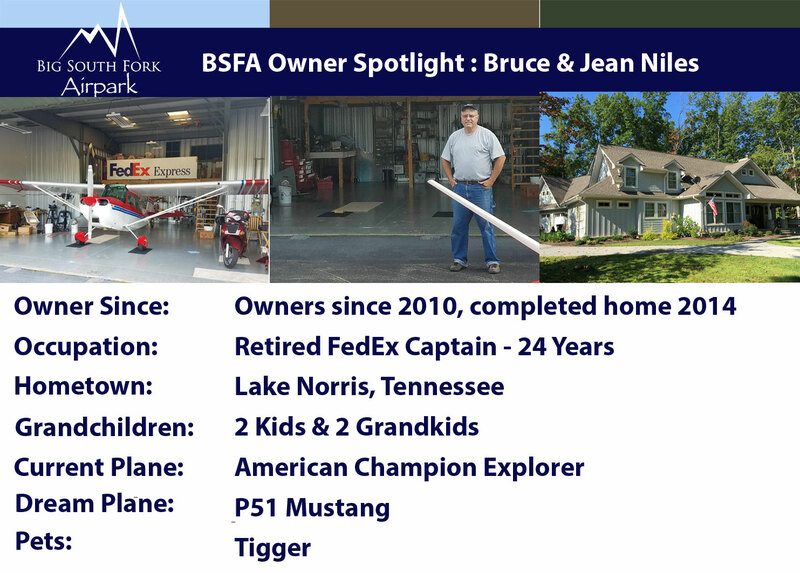 We are so lucky to have so many residents choose Big South Fork Airpark to be their home. We celebrate our residents each year with countless events – ATV rides to the river, Spring Oyster Roast, Annual Fourth of July & Fireworks and New Years Party and much more.